Please join us for a gentle one hour practice. This class incorporates modifications for all body types, sizes and shapes and is a safe space for people working through body image concerns. 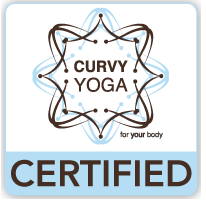 Maggie is certified in Curvy Yoga, Hatha Yoga, Vinyasa Yoga and in working with trauma survivors. We are thrilled to have Maggie back to Heart Space. She was part of our early team of instructors. This class is a is very gentle on the body and powerfully cleansing to ones spirit. It is good for anyone no matter experienced in the ways of yoga or a beginner. It provides movement that feels good and needed and it offers deep relaxation all at the same time. It also leaves you feeling more gathered and centered making it a good exchange of your time and resources. I hope you will give this class a try. I started practicing yoga at age 17, encouraged by my mother who thought it might settle her anxious daughter down a little. My practice waxed and waned for a little while, but after a serious back injury caused by repetitive stress from work, I found myself practicing everyday in 2001. Since then, my weight has ranged between 60 lbs; I’ve practiced with bones pressing into the hard floor, and I’ve practiced with frustration at not knowing how to move my curvier body. Through all of that I learned how to lean into breath. Now when I teach, I modify for every student, remembering my own needs at different shapes. I try in every class to make space for students to find their way to strength and stability. I mix both elements of standing balance and an easy flow-based class. I try to not take myself too seriously; I like to mix the sacred with the profane.